As the best GPS Tracking Company in India, Letstrack has launched a market leading AIS140 approved GPS tracking device in India. Covering all major cities of India, our award winning Government approved GPS trackers and powerful app and web platform provide a solution for all walks of life from school buses to commercial vehicles to independent taxi drivers. What is an AIS 140 approved GPS tracking device? Letstrack is the number 1 GPS tracking company in India with pan India installation and service capabilities. Our comprehensive family of GPS tracking devices include both AIS 140 GPS trackers and ARAI GPS trackers. Whatever the size of your company, or needs of your vehicle, Letstrack can supply and fit your government approved tracking device at your convenience anywhere in India showing why we are the leading IoT company in India. Any organization that deals with the transportation of goods from one part of the country to another is familiar with fleet management and the problems it brings. Fleet management includes taking care of vehicles and carriers transporting goods from one point to another. For fleet management, companies want to ensure that they do not suffer costly breakdowns that result in delays in product delivery and cause financial losses. To avoid such situations, CTOs and CIOs look for smart solutions to help them maintain fleets better. The IoT technology is a smart solution that helps companies in numerous ways, and fleet management might just be another aspect of businesses affected by the transformational wave of IoT. Even though IoT has several applications for transforming businesses, fleet management with IoT is a novel one. IoT consists of devices that communicate with each other through the Internet. Company authorities can keep track of a vehicle's geographical position with the help of sensors. These sensors also advise drivers about the status of their vehicle, how far it can go and what is around them. Sensors can notify both the drivers and company authorities about any possible breakdowns from the scanning of the vehicle. Businesses and their authorities can now focus on consulting IoT leveraging businesses like Letstrack to leverage fleet management with IoT, increasing the speed of delivery, resulting in increased sales. 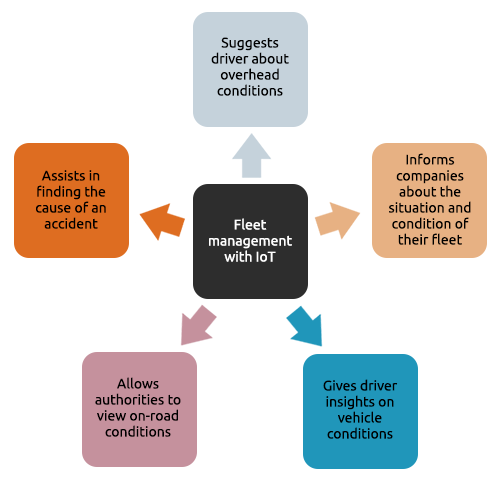 Organizations should wisely choose from the available IoT fleet management services based on what kind of products they transport and how this technology will help overcome the drawbacks of their current fleet management systems. The best way to experience Letstrack is by downloading our completely free app from the iOS or Play Store. Once you have registered the app we can organise a demo vehicle to be added to your devices list. You can contact Letstrack through our website to organise a live demo of any of our devices including our AIS 140 government approved GPS Trackers or to find out more. Where can I buy my AIS 140 approved GPS Trackers? Letstrack have the biggest distribution network for GPS tracking devices in India, as well as being the largest online retailer of trackers in the country. If you would like any more advise about how to purchase a product please get in touch via our website, by email us at support@letstrack.in or give us a missed call. When and where will Letstrack install my Tracking Device? As the biggest GPS tracking company in India, Letstrack is proud to offer pan India installation wherever is most appropriate for each customer within 48 hours of purchasing your AIS 140 GPS tracking device. Letstrack offer truly national sales, installation and servicing including a 24 hour centralized call center, so wherever you are and wherever you go, we are always by your side to help when you need it. Letstrack is built with a software company at it’s core and supported by a highly skilled team of ex telecoms and insurance sector professionals meaning our coverage and capabilities are unequalled. GPS tracking is in our blood. By focussing our team on being the best tracking company in the world, you can be sure to get the very best solution available. Letstrack have a strong company ethos of giving back to our communities. We help fund the education of children across India through our partnership with SMILE Foundation.